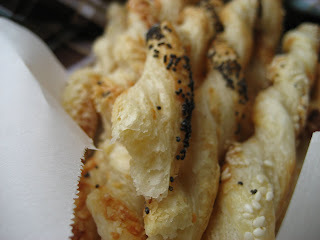 Puff Pastry Cheese Straws... A real quick and tasty snack or a great addition to any bread basket. You can make this recipe with any store bought puff pastry. 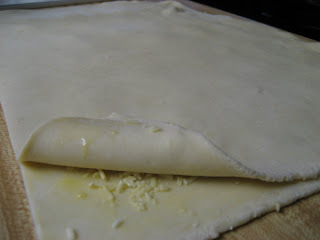 But, since I moved to Montana, I started making my own puff pastry at home. I happened to stumble upon Martha Stewart's cookbook at the library(a few years ago) and found this "quick" version of the classic puff pastry. The puff pastry still has many delicate flaky layers, it tastes much better that store bought and it comes out much cheaper making it at home. Plus, you get the satisfaction that you made it! Preheat oven to 425 deg F. Line 2 baking sheets with parchment. 1. Roll out sheet of pastry to about 1/4 in thick. Brush with beaten egg. 2. 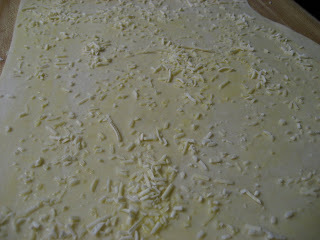 Sprinkle about 2-3 TBS of Parmesan cheese all over the surface. 3. Place second sheet on top and brush with beaten egg. 4. 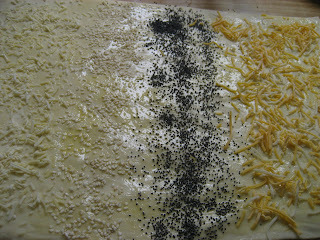 Sprinkle with various toppings on 4 sections or stick to just one. I like a variety. 5. Cut into thin strips about 1/4 x16 . Transfer strips to baking sheet. 6. Taking both ends with your fingers twist in opposite directions forming a spiral shape. 7. 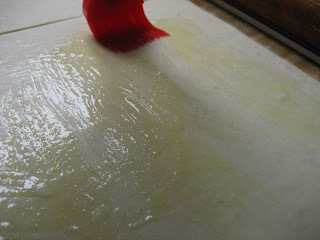 Press ends of the spiral trips unto the parchment paper to prevent them from unraveling. Place them in the fridge if you like(or if your house is on the warmer side) to chill them for about 15-20 minutes before placing them in the oven. 8. Bake one sheet at a time for 12-15 minutes or until golden brown. 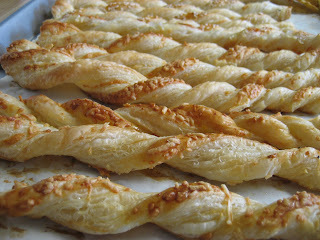 You have no idea how much I love these cheese straws, I live in Egypt and they're very hard to find, especially in good quality. I'm so glad I came across your recipe. Are the quantities (2 pounds, 11 oz. of dough) mentioned in your "Quick Puff Pastry (Martha Stewart)" post sufficient to make two sheets 12x16 mentioned in this Cheese straws recipe? Thanks for stopping by...I hope you like the cheese straw. I have to tell you that I love making this pastry. You must have everything absolutely cold for making these. Your house must not be too hot as that will melt your butter in the dough and not make your pastry pufff up. Also, make sure you have UNsalted butter as this helps with not melting as fast. i just love cheese sticks..they are easy to make and super delicious!!! Delicious! These were much better than store bought. No comparison! I like that the straws can be frozen for a few weeks before baking. I used mozzarella cheese from the can. No grating! It's important to refrigerate the straws for 30 mines. Before baking. Though not as impressive, I found cutting the straws in half made them easier to handle. Thanks! 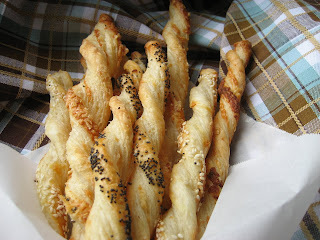 I like this cheese straws recipe, and the pictures with it are brilliant. I like to use mature cheddar with mustard as here in England that is how we get them from fast food places. I will try yours though, without the sesame seeds most probably. Emma, Thanks for stopping by....your version with cheddar and mustard sounds delicious! 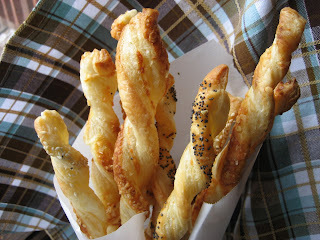 I hope you enjoy the cheese straws... it's fun to be able to customize them to preference. I made these twice already. My husband and my daughter devoured them. I used your quick puff pastry recipe. I actually used caraway seeds on them. They are so easy to do! If only they didn't have so many calories... Is it possible to make them with less butter? Or maybe with only one sheet instead of two? Thank you for making cooking and baking look so easy, Ellie. Merry Christmas! You know, as much as I try lowering fat amounts in most recipes, there are those recipes that just don't let you cut out too much. Mostly because the success of the recipe depends largely on the butter... as it gives it the taste, flakiness and tenderness it needs. But having said that, you can certainly lower the butter amount by a bit, adding maybe a bit of water as needed to make the dough cohesive... I'm thinking even a bit of vinegar(maybe a tablespoon or so) as it would help to make the dough a bit more tender due to cutting down on the butter. It's definitely worth a try, but the less butter you have the more of a "pie crust" you'll get:). You can definitely do one sheet only, but you'll have to watch the baking time so they won't dry up too much... or try rolling the dough a bit thicker. These definitely are buttery, as all puff pastry recipes tend to be. But I try not to bake them too often... so I totally understand you:). Glad you had success and thanks a bunch for stopping by. Wishing you and your family a most blessed Christmas!